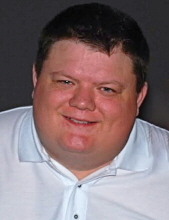 Age 47 of East Lansing formerly of Owosso, passed away Tuesday, January 29, 2019. A Mass of Christian Burial will be held 11am Saturday, February 2, 2019 at St. Paul Catholic Church with Fr. Michael O'Brien officiating. Burial will take place at Alton Cemetery in Bennington Township at a later date. The family will receive friends at Nelson-House Funeral Homes, Owosso Chapel on the day of service from 9:30am until time of procession to the church. Jeffrey was born May 24, 1971 in Owosso; the son of Rick and Sandy (Edwards) Hall. He was a 1989 graduate of Perry High School and was employed with Meijer of Okemos for 26 years. Jeffrey was a volunteer for CRW for many years and looked forward to the Curwood Festival and the Shiawassee County Fair. He was passionate about knowing all the vendors and sharing his favorites to family and friends. Jeff loved watching trains at the Durand Depot. He had a passion for knowing what was going on in the community. He enjoyed spending time at Leisure Lake with family, playing dominos and cards, enjoying bonfires, cruising the roads of Leisure Lake on the golf cart and going on pontoon rides. Jeff was a caring, gentle soul, he loved making people smile and laugh by telling stories and jokes. He had a heart of gold and always saw the best in people. Jeff will be greatly missed by anyone that knew him. He is survived by his parents Rick and Sandy; sisters Jennifer Hall (David Pease) and Julie (Kevin) Pfeifle; nephews Trevor Klco and Ace and Brody Pfeifle; aunts and uncles Bonnie and David Brown and Doug and Noreen Edwards; cousins Betsy and Matt Kettmann, Kayla (Darren) Rumery, Nathan (Teresa) Brown, Brian Edwards, Greg Edwards, and Shaliece Hall; special friends Andy Leverett and Mike Pavlica, and many other loving family members and friends. Jeffrey was predeceased by his grandparents Arlie and Rosemary Edwards, Robert and Lois Hall, uncles Jim and Carl Hall. In lieu of flowers memorial contributions are suggested to the family. To send flowers or a remembrance gift to the family of Jeffrey Richard Hall, please visit our Tribute Store. "Email Address" would like to share the life celebration of Jeffrey Richard Hall. Click on the "link" to go to share a favorite memory or leave a condolence message for the family.